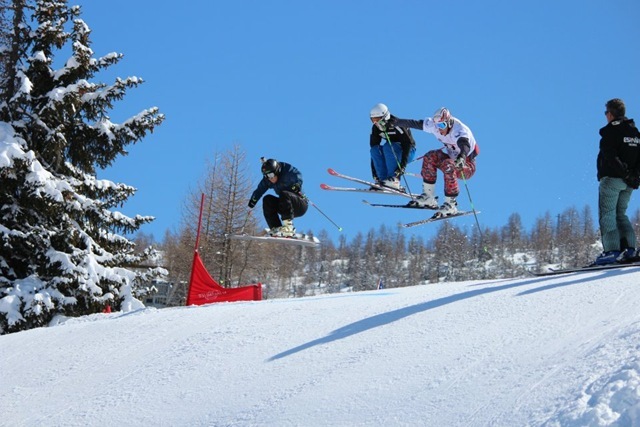 Having travelled around 5000 miles, gone through 9 different countries, spend 3 nights sleeping in airports and minibuses, Marek Behnke has finally arrived home from the World Junior Freestyle Ski Championships. He had just 7 days training on snow this winter, when he went head to head with the best junior ski cross racers in the world. The training run day was frustratingly cancelled due to heavy snow, but race day was a perfect day for ski racing. Clear blue skies and a fantastic technical course full of enormous jumps. “An awesome course” declared Marek. Marek had been set the tough challenge of qualifying for the heats, which would mean that he would be in the top 32 in the world and would need to ski above his ranking for this season. A fast clean run saw him lying in 28th with 11 to go. Thirty nail biting minutes later, saw him achieve that goal. A tough draw against the world number 1, he battled down the course in the first round of the heats, but despite closing fast at the end. Sadly he was unable to qualify for the next round. Finishing in 32nd place, was a fantastic achievement given his lack of training against skiers who have spend the whole season racing and training. It is so frustrating that natural talent cannot be realised due to lack of funding, and a less than ideal preparation which saw him sleeping one night at the airport in Oslo, followed by a second consecutive night sleeping in a minibus as he travelled across Europe to Italy. Marek now has the World Student Games next January as his target, and is still seeking sponsorship to achieve this aim, and to pay for the costs of this season.